We’re absolutely thrilled to be recognized by such a distinguished panel of mobile industry judges for our important work alongside DIDMO and GetJar in bringing attention to social justice issues globally. 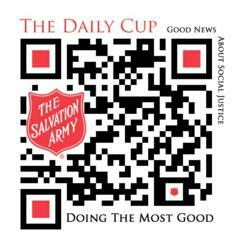 The Salvation Army USA Southern Territory, DIDMO, creators of the award-winning Magmito mobile application creation solution and GetJar, the world’s largest free app store are pleased to announce that The Salvation Army Daily Cup Social Justice mobile application has been shortlisted as a finalist for The Effective Mobile Marketing Awards in the “Most Effective Mobile Charity Campaign/Solution” category. Sponsored by UpStream, Propel and OpenMarket, the awards will be handed out on November 3, 2011 in London. The free Daily Cup Social Justice mobile app, which works on all phones, addresses important social justice issues through building awareness and encouraging donations of time and money from mobile consumers. The app features a blog feed, regularly updated with news not commonly found on most other media about donations at work, globally, via The Salvation Army. The app also highlights important information on social justice including sobering statistics and content on human trafficking, hunger, homelessness, disaster, and HIV/AIDS, to name a few. It also features embedded video. Participation among those who download is encouraged via a feedback form for volunteer inquiries and donation options including a special “Donate $10 now” button. The Daily Cup Social Justice mobile app was created using DIDMO’s award-winning Magmito platform and was promoted via the GetJar Store. http://getjar.com/Salvation-Army or scan the custom QR Code. The Salvation Army, an evangelical part of the universal Christian church established in London in 1865, has been supporting those in need in His name without discrimination for 130 years in the United States, and in 124 countries around the world. Nearly 30 million Americans receive assistance from The Salvation Army each year through the broadest array of social services that range from providing food for the hungry, relief for disaster victims, assistance for the disabled, outreach to the elderly and ill, clothing and shelter to the homeless and opportunities for underprivileged children. 82 cents of every dollar The Salvation Army spends is used to support those services in 5,000 communities nationwide. For more information, go to http://www.salvationarmyusa.org. GetJar is the world’s largest free app store with over 2 billion downloads to date. The company distributes more than 150,000 mobile applications across a variety of operating systems including Android, Blackberry, Java, Symbian and Mobile Web. In 2010, GetJar was named a Technology Pioneer Award Winner by the World Economic Forum and listed by TIME magazine as One of the 10 companies that will change your life. GetJar is headquartered in Silicon Valley with offices in the UK and Lithuania. For more information, please visit http://www.getjar.com and follow us @GetJar.